The power for this cordless table saw is quite surprising which is the biggest, pleasant surprise among consumers. This is something you don’t typically see in cordless power tools, and considering the portability of this model makes it even more surprising. Consumers have raved over its performance of the DEWALT DCS7485T1 FLEXVOLT 8-1/4″60V MAX Table Saw Kit with subtle cons which are easily overlooked. When looking to buy a new power tool it’s so easy to start with one of the most trusted names in the business. DeWalt is one of those names that buyers look for in power tools, and if you’ve been around the tool shed you know it’s a good place to start. 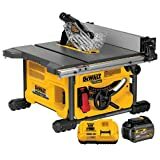 DeWalt table saws can be found on jobsite and have become popular with those into DIY projects and others with more of a professional outlook on projects. The DEWALT DCS7485T1 FLEXVOLT 8-1/4″60V MAX Table Saw Kit is not your average power tool which has been seen with good sales in a short amount of time. This compact cordless table saw offers users a good balance of power and portability making it a popular choice on and off the jobsite. If you’re looking for a new table saw that is highly portable, yet powerful enough resembling corded models, then this may just be it. One of the best things about the DEWALT FLEXVOLT 8-1/4″60V MAX Table Saw Kit is that it offers the power of a corded model, but flexibility of a cordless model. This powerful table saw runs on cordless while being distinguished as the first model that changes voltage to match the tool it’s outfitted in. The versatile battery operation makes it a great addition to other cordless power tools which can share the same battery while customizing the operation itself. Giving users the ability to be free from cords makes the DEWALT DCS7485T1 highly portable. Weighing in at under 50-pounds, this power tool can easily be moved from jobsite to jobsite and offers a smaller size which doesn’t require a lot of space. The DEWALT DCS7485T1 FLEXVOLT 8-1/4-inch MAX Table Saw features a durable metal roll cage base. This sturdy construction is much stronger than traditional plastic bases which provides a great platform which was built to last. This also reduces vibration and movement which is typically seen in other bases which also has an impact on precise cutting. Users have also noted simple, easy fence adjustments which offer great accuracy and smoother cutting. The telescoping fence is made of Rack and pinion construction with a smooth finish which makes moving material effortless. Safety is also defined this this DeWalt table saw which features a power-loss reset which stops accidental start-ups.